More than 70 people attended a community conversation inside Fairbanks Correctional Center on May 2, 2018. Photo courtesy of Dept. of Corrections. Some people stay at Fairbanks Correctional Center for a few days. Others are at the pre-trial facility for years. Most of the inmates are living their lives in limbo — awaiting their trials and their futures. During Community in Unity: Life in Limbo, inmates, correctional center staff, and other community members sit together for an open conversation about the justice system, day-to-day life at FCC, and what’s happening on the outside to help people who are released. Listen to previous events here. 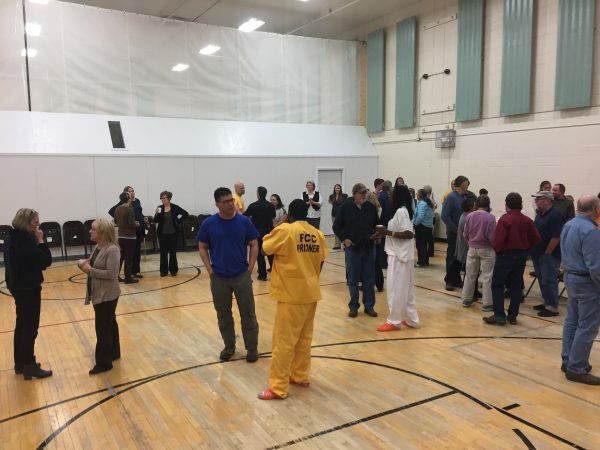 Community members who live inside and outside the Fairbanks Correctional Center mingle after the community conversation. Photo courtesy of Dept. of Corrections. Community in Unity is a participant of Finding Common Ground, a project funded by the Robert Bosch Foundation and CUNY’s News Integrity Initiative and coordinated by the Agora Journalism Center.